Can you believe it’s almost Spring Break? With midterms winding down and warm weather fast approaching, it’s time to revisit some of our favorite Boston spots. 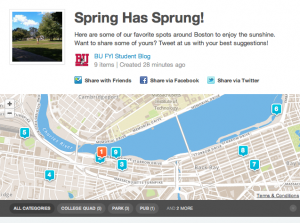 Check out this foursquare list we made! Have more ideas? Tweet us @BU_FYI with your suggestions! Enjoy your spring break, Terriers!